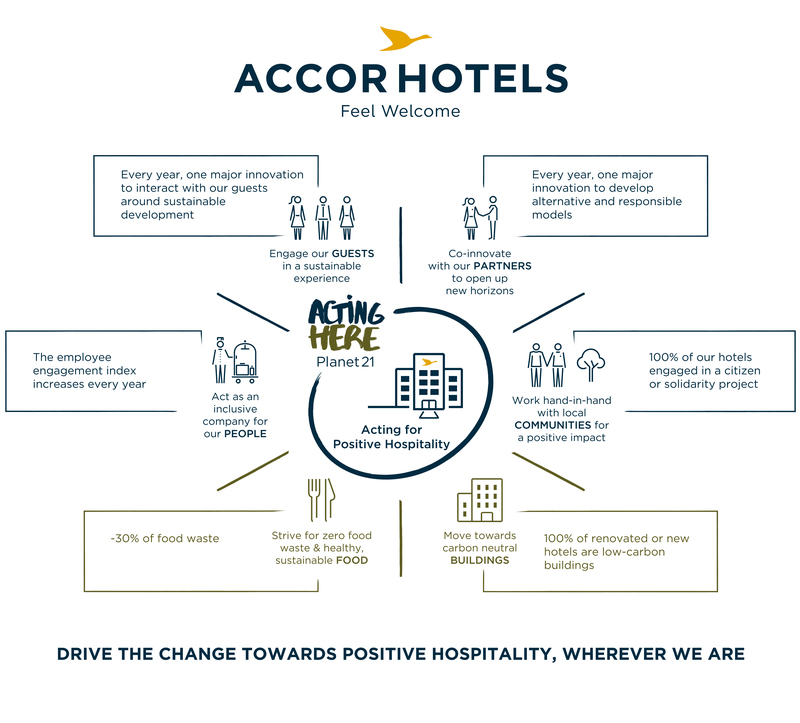 AccorHotels, the world’s leading hotel operator, today presents the results of Planet 21, its sustainable development program, and renews its commitments looking to 2020. As part of a policy of progress and transparency, the Group asked its customers for their views on these issues, updated its environmental footprint and assessed its socio-economic footprint for the first time to assess the challenges it faces and construct its new 5-year program. The program for 2020 was drawn up in consultation with the teams. It reinforces some of the Group’s fundamental commitments, such as curbing its environmental footprint, and identifies new objectives which dovetail with both the changes to the business model and its strategic priorities, such as Food & Beverage and the sustainable management of its property portfolio through HotelInvest. To provide the hotels with effective support as they deploy this new plan, Charter 21, the in-house sustainable development management system for hoteliers, has evolved and been renamed Planet 21 in Action. The new system aims higher and is more accommodating as regards local specifics and operational realities. It is more flexible and is based on a participative approach allowing each hotel to set its own objectives and map out its own action plan. A common baseline comprising 16 mandatory actions, sets a demanding first level of commitment (bronze status). To upgrade their status (to silver, gold and platinum), hotels then select the actions they wish to implement from a wider range of initiatives. This system encourages ownership of the issues at stake as well as employee and guest accountability regarding social and environmental responsibility. The Group achieved solid results regarding the actions taken over the 2011-2015 period. In five years, it has delivered two-thirds of the program’s 21 objectives and over 90% of its hotels have embarked on a continuous-improvement drive. Planet 21 allowed the Group to unite its teams and engage its guests and partners in a structured approach which is recognized by several ethical stock market indices. It has made significant progress, in particular as regards well-being in the workplace, child protection, biodiversity, and water and energy consumption management. In five years, water consumption has been cut by nearly 9%, energy consumption by 5.3% and carbon emissions by 6.2%. At the end of 2015, all its hotels were committed to protecting children from abuse (in-house awareness program, WATCH) and more than 4.5 million trees had been planted worldwide since 2009.